Previous: IS FUN TOO MAINSTREAM FOR TODAY'S TEENAGERS? Countries around the world have, in recent years, seen a sharp rise in clown related criminal activity. “The first attacks started in France,” says criminologist Victor Rire, “then they spread to England, Spain, Germany, and now Canada. We’re not sure why this is happening. We suspect it has something to do with the popularity of Chris Nolan’s The Dark Knight, a movie about a murderous clown preying on a man who dresses up as a human bat. People are highly susceptible to the culture they consume, and when they watch actors dressed as clowns terrorizing people, they instinctively want to imitate them. People are too stupid to tell the difference between movies and reality. That's a scientific fact." Many academics agree. “People are just empty vessels through which culture propagates,” says sociologist Josephine DeMaistre, “and that’s why it’s important for us, as a society, to ban all art forms that promote morally incorrect political beliefs. If we don’t ensure that only the right kind of art is made, our entire civilization will be destroyed by killer clowns." 19 year old Tumblr user Anita Huggs shares Josephine's concerns. "Art is far too dangerous to be free," says Anita. "It needs to be heavily regulated by University undergraduates who possess just enough knowledge of critical theory to be obnoxious and insufferable. When people are free to create anything they want, they turn into murderers who wear red rubber noses. I know this is 100% true because I read a blog post that said it was. " The Canadian Union for Professional Clowns released a statement that echoes the above concerns. “Most clown are peaceful people, dedicated to making the world a better, brighter place. Christopher Nolan’s 2008 depiction of a murderous clown has directly lead to today’s reality of violent clown gangs. He has caused us law abiding buffoons and jokers irreparable harm. We hope the government will intervene and ban future depictions of violent clowns." Police, for their part, are having trouble tracking down the criminals who were responsible for the attack. “The citizens of Montreal should be on the look out for dangerous clowns,” says Sgt. Batista of the SPVM. “If you see someone wearing a colourful wig and holding a machete, do not approach them." What do you think? 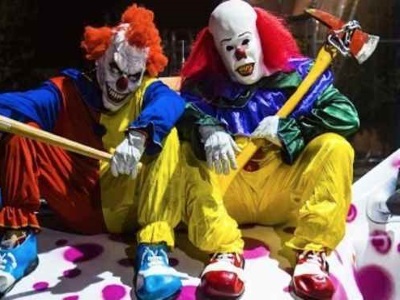 Are violent clowns caused by Hollywood movies? Should people be afraid of floppy red shoes? Let us know!